A variety of potato engineered to be resistant to the pathogen that caused the Great Irish Potato Famine has been approved for deregulation by the USDA. 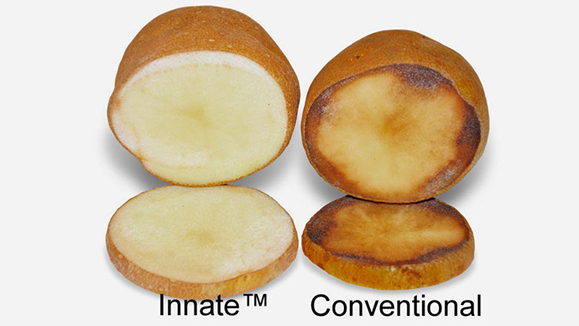 The J.R. Simplot Company’s so-called Innate potato is more resistant to bruising and black spots than most varieties. When cooked at high temperatures, this potato also produces less acrylamide, a chemical compound that some suggest might cause cancer in humans if ingested in high amounts. The Innate potato can also be stored at lower temperatures, increasing its shelf life and further reducing food waste. Perhaps its most impressive trait, however, is its ability to stave off potato blight, not only reducing the amount of fungicide needed to protect the crops in the field, but also reducing the likelihood of total crop failures such as those that decimated the Irish population in the mid-nineteenth century. Though there are opponents of GMOs, the Innate potato is cisgenic, meaning that it doesn’t contain any genes from any other species than potatoes.